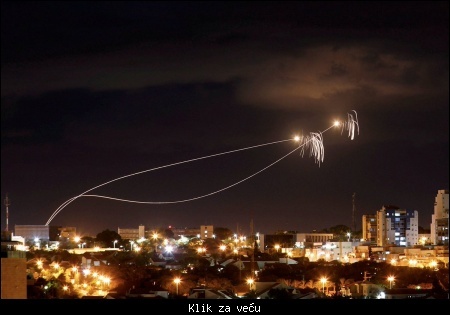 Citat:On 23 July, the Israel Defence Forces (IDF) for the first time launched 2 David’s Sling aerial defense system interceptors against rockets were from internal fighting in Syria. Following local media reports that the Israel Defense Forces launched interceptors against Syrian OTR-21 Tochka (NATO designation “SS-21 Scarab”) short-range ballistic missiles. According to the IDF’s report, in response to the threat, the IDF launched 2 David’s Sling aerial defense system interceptors. In later reports say that the SS-21s had not been aimed at Israel, but rather were part of the fighting in southern Syria. Постоји инфо да је промашио сиријске Точке. Zvanični izraelski podaci su kontradiktorni ali definitivno je efikasnost oko 75 do 80% (u najboljem slučaju). Recimo pre neko veče od 14 projektila presretnuto je samo 8 (po izjavama svedoka u Izraelu). Po podacima CAHAL presretnuti su "skoro svi projektili" (šta god to značilo). Iron Dome automatski reagovao na mitraljesku vatru Hamasa u Gazi te lansirao 11 raketa. Citat:Israel Aerospace Industries (IAI) will supply the “Sky Capture” command and control systems for land-based air defense worth $550 million under a contract recently signed with a customer in Asia. The customer is likely the Indian Army. Citat:Sky Capture is a command and control system for anti-aircraft artillery and Very Short Range Air Defense (VSHORAD) systems that transforms legacy air defense systems into modern, accurate and effective weapons by applying modern sensors, communications and computing capabilities. The system integrates several sensors, including target acquisition and fire control radar systems, including the ELM-2106 Advanced Tactical Air-Defense Radar (ATAR). This 4th Generation 3D is optimized to detect targets with low radar cross-section, such as low-velocity UAVs and ultralights that can be detected from 40-60 km. The ATAR radar can detect helicopters at 40 km, and classify such targets by type, according to the radar signature returned from the rotor blade returns. A solid-state L-Band medium-range radar. This radar combines rotation in azimuth with electronic scanning in elevation. The system also combines an electro-optical (EO) payload for passive track and target identification. System. For the Sky Capture solution ATAR is associated with a separate fire control radar providing effective target engagement with continuous search and tracking of multiple targets. The solution provides accurate target data for the weapons associated with the system and manages to fire parameters to ensure the highest probability of target kill, according to the target type. Typical weapons controlled by the system are the Bofors L-70 cannons and ZSU-23/2 automatic guns. ^ Ovo bi za sve nas posebno za Srbiju koja ima pozamašan broj Bofija zlata vredilo. Verovatno bi mogao i BOV-3 da se umreži uz dodatak posebnog modula SUVu. BOV-3 zbog malog kalibra (20 mm) nema veći značaj sem pri dejstvu po bespilotnim letelicama na malim visinama i Tomahavcima (teorijski). Dobre su za dejstvo po ciljevima na zemlji posebno antiterorističkim dejstvima. Ali bi Prage mogle.